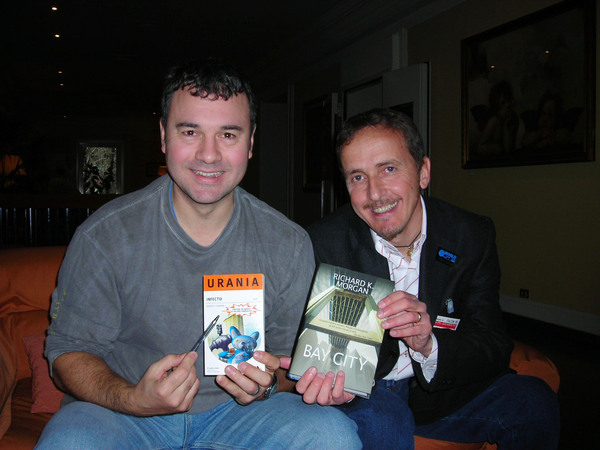 Dario Tonani – born in Milan – is one of the main authors of Italy’s science fiction scene. 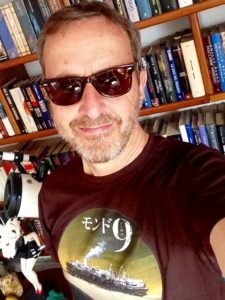 A great sci-fi, noir and horror buff, he has published various novels and around 120 short stories in anthologies, national newspapers and in the most important Italian magazines of the genre (Urania, Giallo Mondadori, Segretissimo, Millemondi, Robot). His most successful series, consisting of two novels and ten short stories is set in a Milan of the future where doped cartoons (known as +toons) roam the streets infecting the citizens with a new powerful drug which is transmitted via the retina. His first title “Infect@”, runner-up at the “Premio Urania” 2005 and published in 2007 by Mondadori, was optioned for a film. The sequel “Toxic@” was published in 2011 together with other short stories relating to the saga. Another series, also based in Milan (Dario’s hometown), consists of two novellas which were both published in the “L’Algoritmo bianco” (Mondadori, 2009). The protagonist is a killer who moves through the bowels of a city and its corrupt technology in the year 2045. In 2011 Tonani completed his steampunk/horror saga set on World-9, the story of a giant sentient ship-truck grappling with a wild and poisonous planet. The four stories that make up the series have all been published under the title “Mondo9“ (Delos Books, 2012): “Cardanica”, “Robredo”, “Chatarra” and “Afritania”. 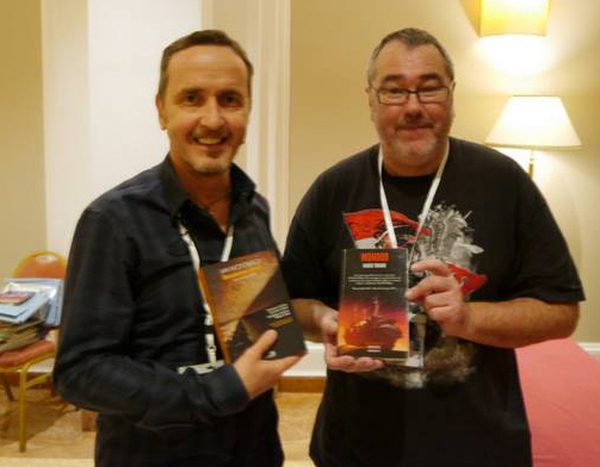 After achieving great success in Italy, the first of them is being published in the US, where it has earned the praise of undisputed steampunk maestro, Paul Di Filippo. In 2014 “Mondo9” has be translated and published in Japan. On August 2015, another edition of the fix-up “Mondo9” together with the new stories (“Cronache di Mondo9”) has been published for Millemondi Estate (Mondadori). Dario has won numerous awards: Tolkien, 1989; Lovecraft, 1994 and ’99; Italia, 1989, 1992, 2000, 2012, 2013, 2014, 2015 and 2016; Robot, 2013; Cassiopea, 2013, ESFS Award – “Best Author”, 2017. The best of his sci-fi short stories is found in the “Infected Files” anthology published in 2011 – both on paper and in digital format – by Delos Books. Married, with a 24 year old son, Tonani lives and works in the suburbs of Milan, a stone’s throw from the places he describes in his stories. He is currently working on a new novel/thriller as well as on various non sci-fi stories. 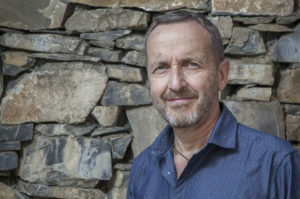 Dario Tonani had won the Cassiopea Award (The European Science Fiction Portal). Interview to the Japanese Publisher of “Mondo9”. An English review of “Cronache di Mondo9” (Fragments of a Hologram Dystopia). Another English review of “Cronache di Mondo9” (Inkroci). 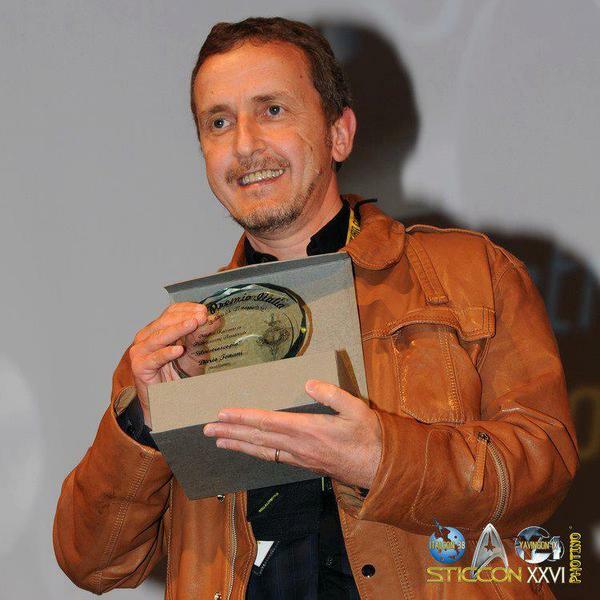 "ItalCon 2012", Bellaria: Premio Italia a "Silvestroscopio". 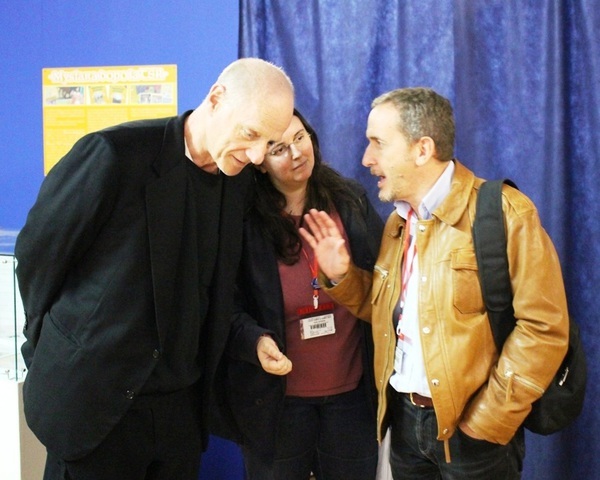 Con Pat Cadigan, Stranimondi 2017. 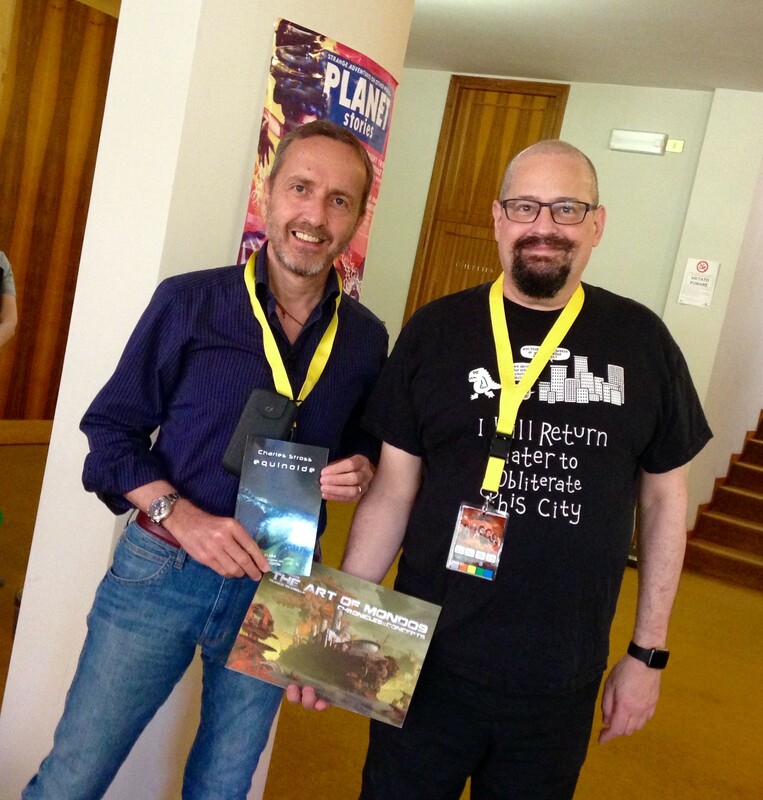 Con Charles Stross a "ItalCon 2017", Chianciano Terme (SI). 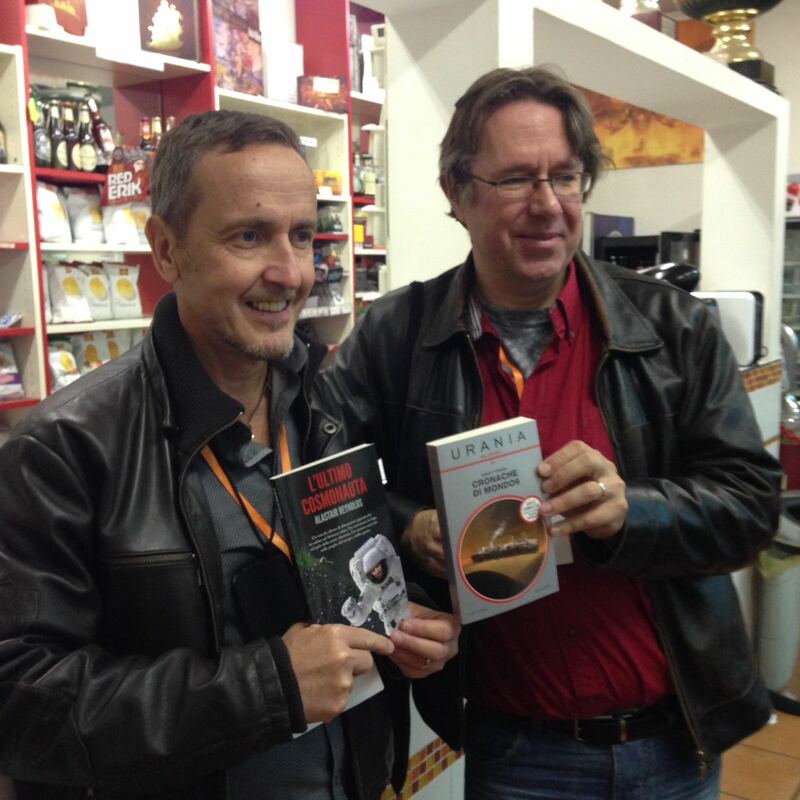 Con Alastair Reynolds a "Stranimondi 2016", Milano. 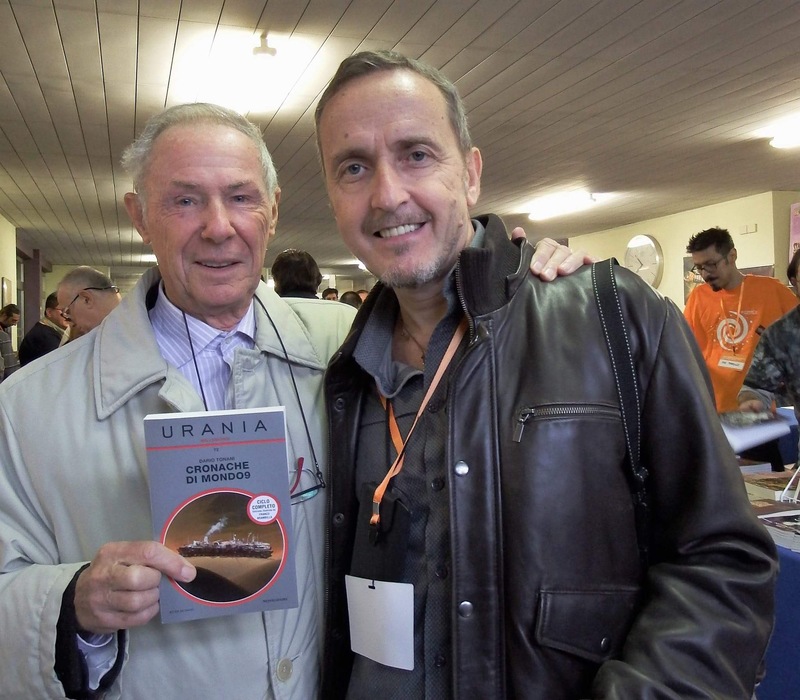 A "Stranimondi 2016", Milano, con Bruno Bozzetto. 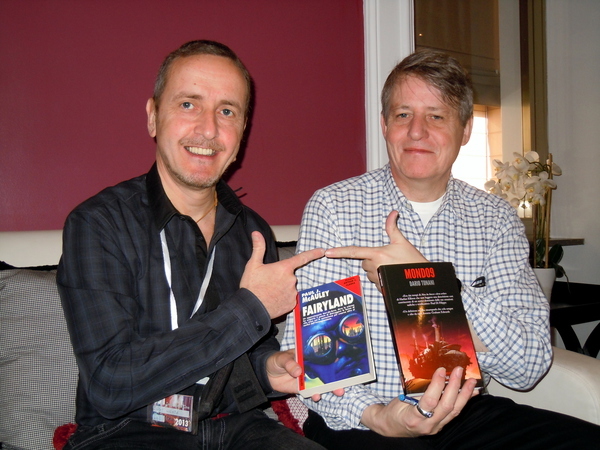 "Deepcon 2016", Fiuggi, insieme con Ken MacLeod. 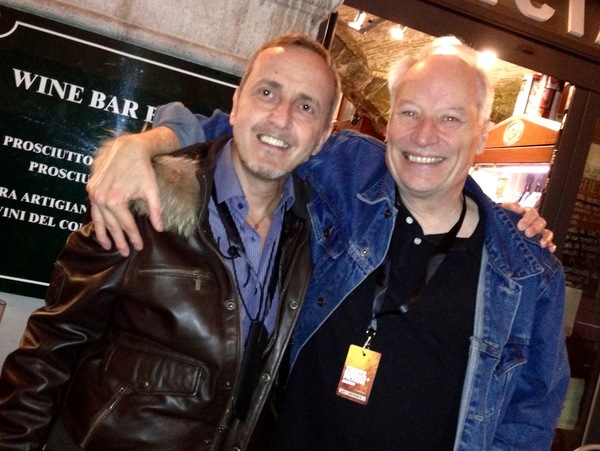 Con Joe Lansdale al "Trieste Science + Fiction Festival" 2015. 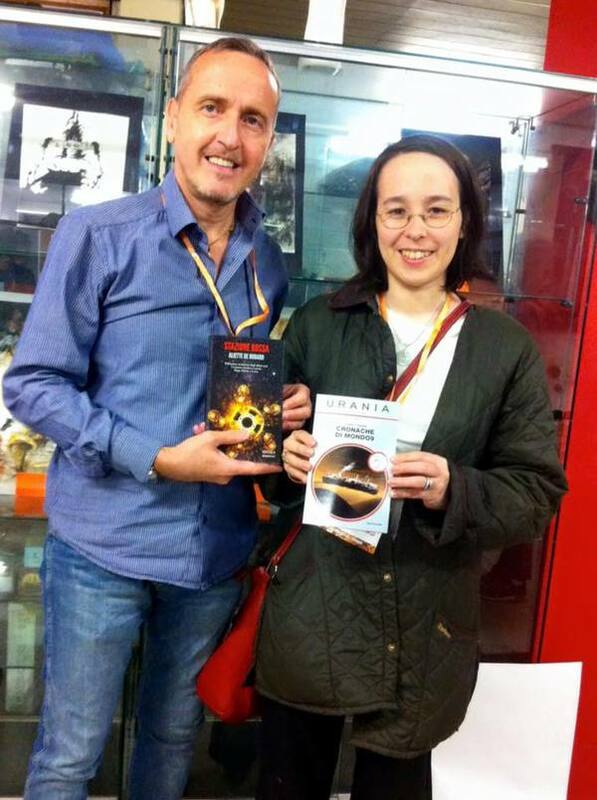 "Stranimondi 2015", con Aliette De Bodard. 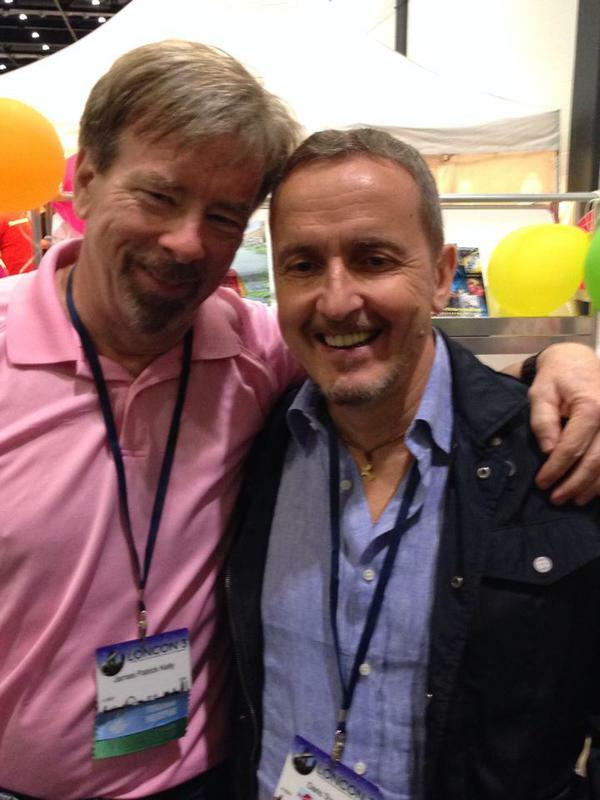 "WorldCon 2014", Londra, con James Patrick Kelly. 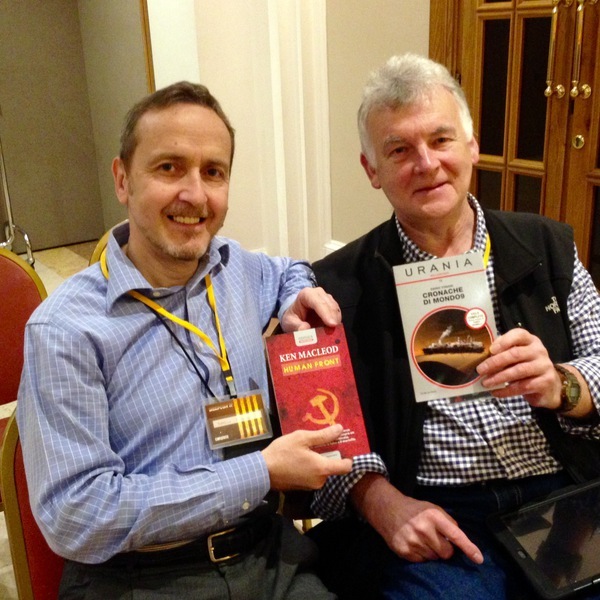 Fiuggi, "Deepcon 2014", assieme allo scrittore inglese Ian McDonald. 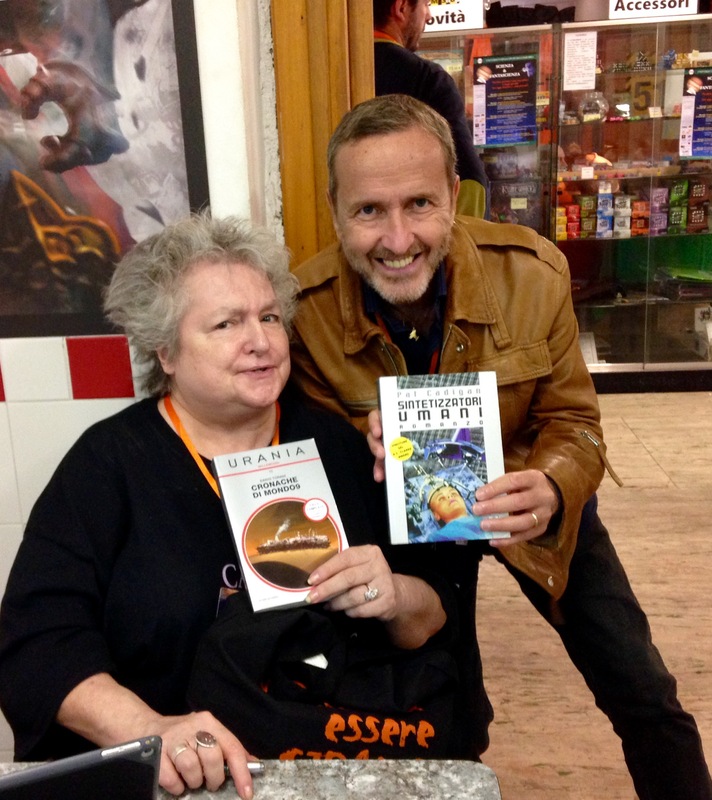 "Lucca Comics & Games 2013", con lo scrittore americano Jonathan Carroll. 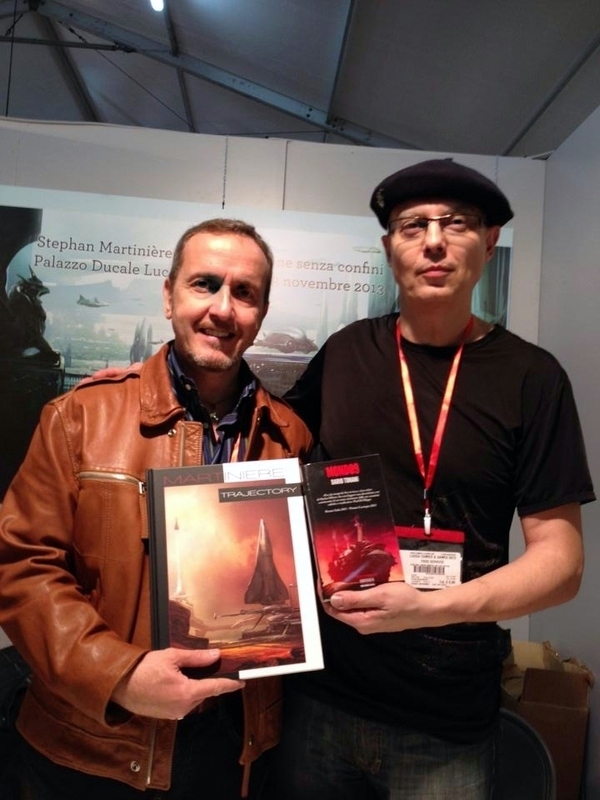 "Lucca Comics & Games 2013", con l'artista francese Stephan Martiniere. 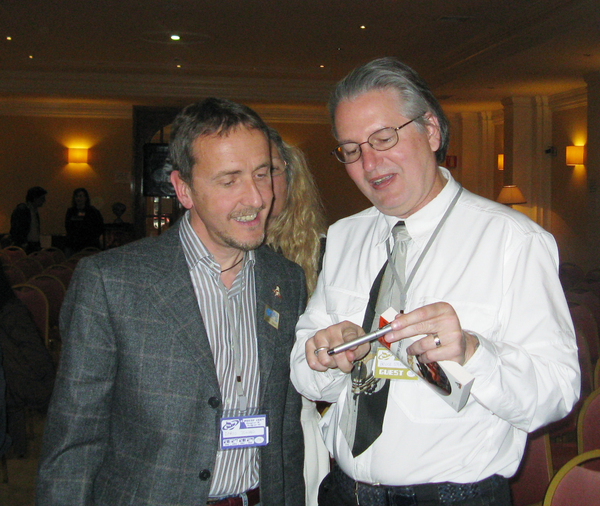 Fiuggi, "Deepcon 2013", con lo scrittore inglese Paul J. McAuley. 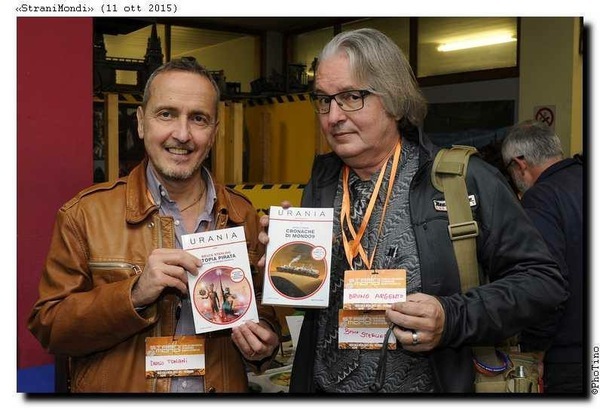 "ItalCon 2012", Bellaria, in occasione del mio Premio Italia: incroci steampunk con Paul Di Filippo. 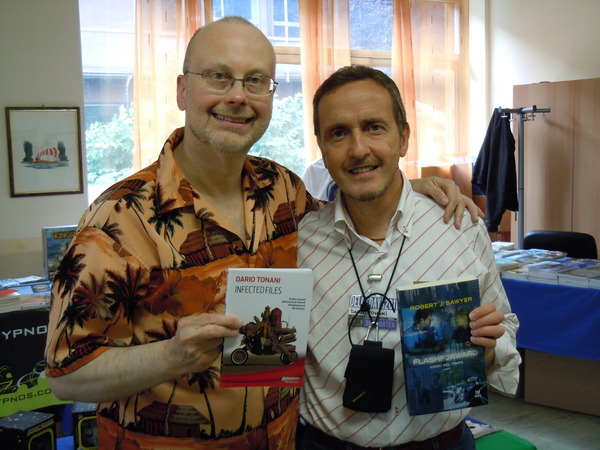 Milano, "Delos Days 2011", con Robert J. Sawyer ci sono anche gli "Infected Files" accanto a "Flashforward". 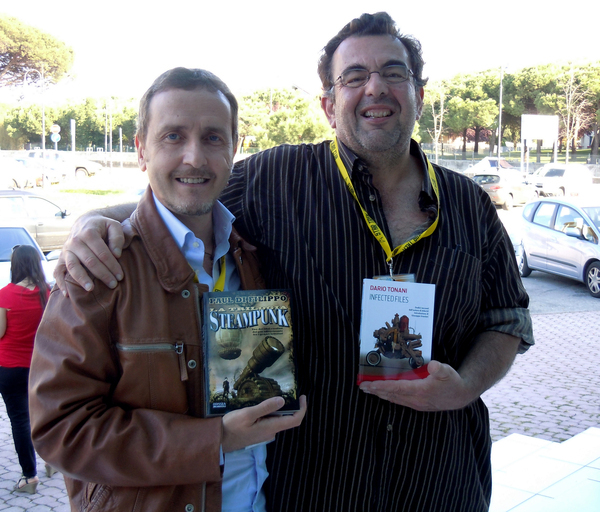 Fiuggi, "ItalCon 2007", scambio di libri con Richard K. Morgan.